“Make time visible” is a favorite refrain of Gretchen’s, and it’s equally as true for college planning as it is for daily time management and organization. In this episode, Megan walks students step by step through how to make the next four years visible…by making a 4 year plan for course selection. Gather information about the courses at your school. Start by laying out requirements and prerequisites on a calendar. Add electives and “one off” classes. 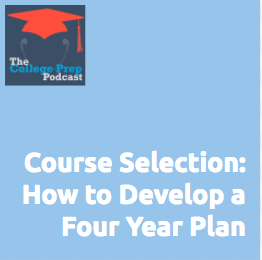 Know your options and make sure you have a back up plan if courses aren’t available when you thought they might be.